Lock in a great price for St Paul's Serviced Studios Sydney – rated 9.3 by recent guests! Clean, tidy, quiet and surrounded by lovely old buildings. Interesting - I did not know there were food options available. The building was brand new and the location, price and service were excellent. Kate was lovely and very welcoming. Sizeable room in a fantastic location. The rooftop area is fantastic with amazing views of the city. Great location, away from the noise of the main street but within walking distance to cafes, bars etc. Stayed here when seeing concert at Enmore. Beautiful grounds, comfy bed, friendly staff and free parking. The location is perfect if you want to visit Newtown. The room was spacious and modern and the bed was comfortable. The free parking was definitely a big plus for us as parking in this area is really challenging. Our 2nd visit to St.Paul's Serviced Studios. We stayed 4 nights, as we did on our 1st visit in February. 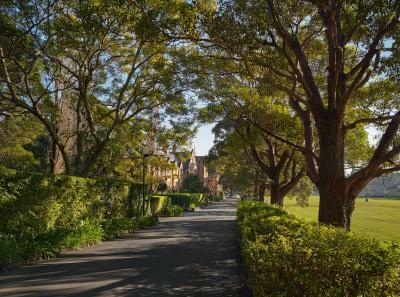 Impressed once more with the new, functional, quiet, great value studios, which are located on the beautiful grounds of St Paul's College/The University of Sydney. 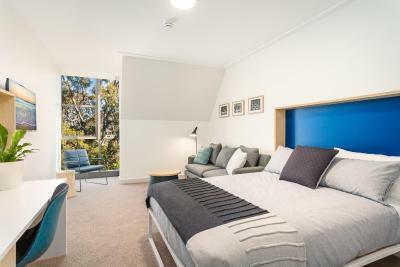 5-10 minutes walk to Newtown shops & restaurants, 15 minutes to Broadway Shopping Centre. Free parking if you travel by car. Looking forward to our next stay! Location was exactly what I was needing. 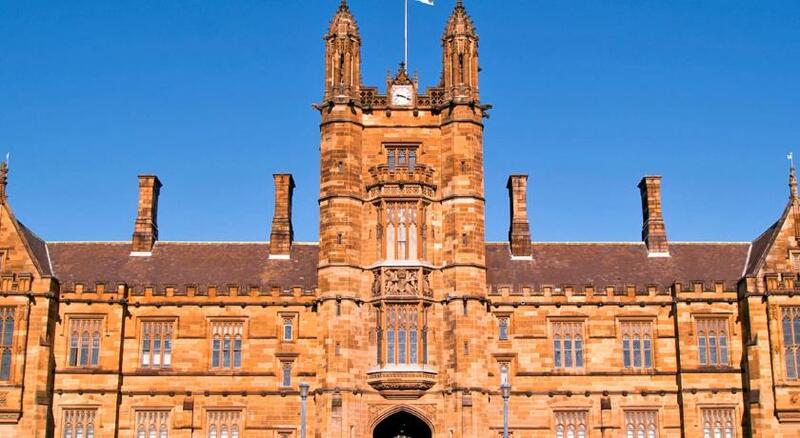 I attended a graduation at Sydney University, therefore, it was perfect! Shops and cafes are all walking distance. Parking was easy and convenient. The staff were very attentive, even had a bottle of wine in the fridge as a graduation present, a very thoughtful and personal experience. Will be back again! Thank you! One of our best sellers in Sydney! 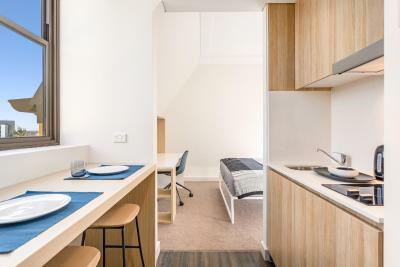 St Paul's Serviced Studios Sydney offers 4-star accommodations, just 1,500 feet from The University of Sydney and a 10-minute walk from Royal Prince Alfred Hospital. 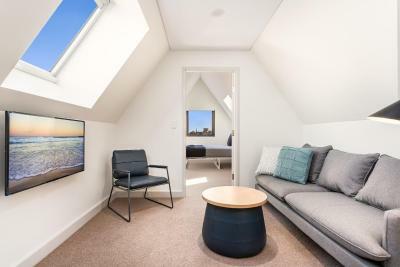 Sydney CBD as well as Sydney’s famous landmarks including the Sydney Opera House, Harbor Bridge and Bondi Beach are all easily accessible from the property via public transport links or within a 25-minute drive away. 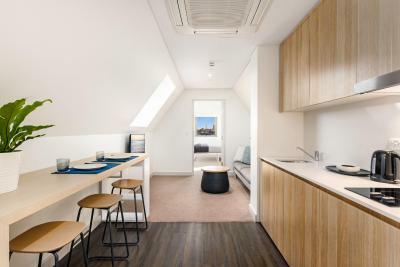 All studios and apartments at St Paul’s Serviced Studios Sydney feature modern furnishings with air conditioning, ensuite with toiletries and a fully equipped kitchenette. 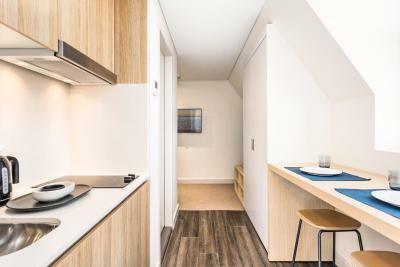 One, two and three bedroom apartments boast separate living areas and all apartments feature free WiFi and a flat screen TV. 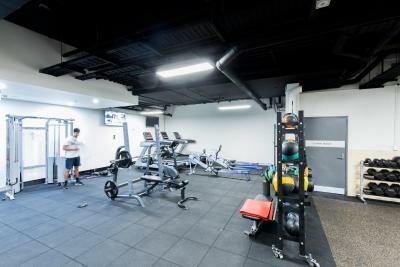 The property also features an on-site fitness center and laundry facilities, along with free on-site parking. Bars and restaurants in the neighborhood of Newtown are a 15 minute walk from the property, while The Broadway Shopping Center is 15 minutes' walk in the opposite direction. There are bus stops located at the front of the accommodations and Redfern train station is 0.8 mi away, both with direct links to Central Station. 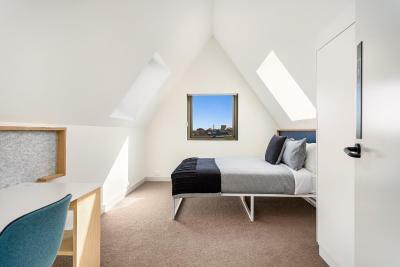 The nearest airport is Sydney Kingsford Smith Airport, 5.6 mi from St Paul's Serviced Studios Sydney. 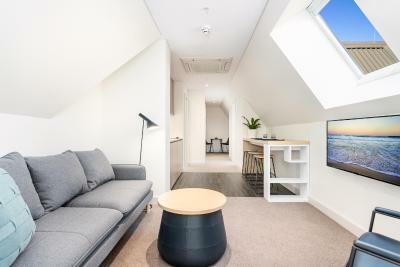 When would you like to stay at St Paul's Serviced Studios Sydney? This studio has air conditioning, sofa and electric kettle. House Rules St Paul's Serviced Studios Sydney takes special requests – add in the next step! St Paul&#39;s Serviced Studios Sydney accepts these cards and reserves the right to temporarily hold an amount prior to arrival. St Paul's Serviced Studios Sydney accepts these cards and reserves the right to temporarily hold an amount prior to arrival. 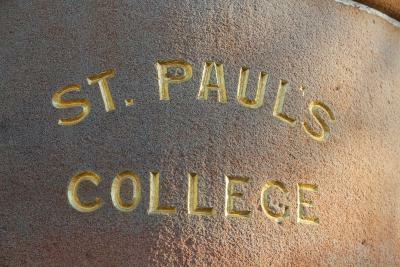 Please note the property is located at St Paul's College. 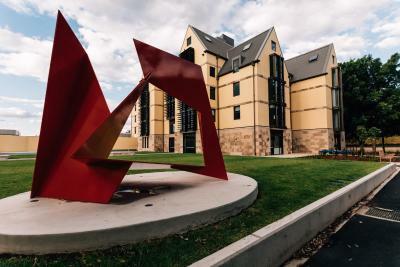 Therefore, there will be college students and academics in residence at the property. For more information, please contact the property using the contact details found on the booking form. Please inform St Paul's Serviced Studios Sydney of your expected arrival time in advance. You can use the Special Requests box when booking, or contact the property directly using the contact details in your confirmation. The nearest supermarket is a 20 min walk. There are no bars or restaurants in close vicinity. Pretty apartment in a pretty environment. They have a large gym room. I could easily find or contact the personel. There was no breakfast that would have been fantastic, but they tell you that there is no breakfast with the accommodation anyway. 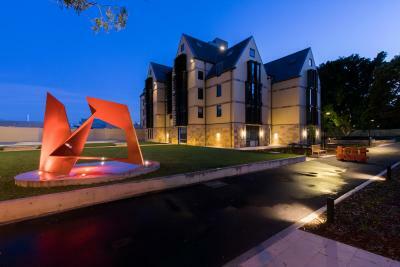 The rooms where great and the College was fantastic would stay there again. Check in was only after 2 pm, no opportunity to leave your bags before then. We were disturbed a few times throughout our one night stay by an emergency evacuation in which the fire brigade came twice and it was raining and wet. The evacuations were false alarms.. The lighting was too bright. There was no desk light or bed light. Just 2 harsh overhead lights. The kitchen area was very tiny. very convenient to the university. Good sound insulation.